It’s something I’ve noticed. I’ve noticed it in the US, and I’ve noticed it among Westerners who visit Japan. After breaking apart chopsticks, they begin rubbing them together. There might be reasons why Westerners do this with chopsticks: maybe they are worried about splinters or maybe it’s something else. Maybe it’s Blade Runner’s fault. Early in the film, Harrison Ford as Rick Deckard sits down at the White Dragon noodle bar and orders. Before Deckard is whisked away by Edward James Olmos’ character, he has an exchange with the bar’s Sushi Master, who speaks to him in Japanese. While waiting for his food, Deckard takes his chopsticks, breaks them apart, and begins rubbing them together. It might not be Blade Runner’s most iconic scene, but it could be one the film’s most impressionable. 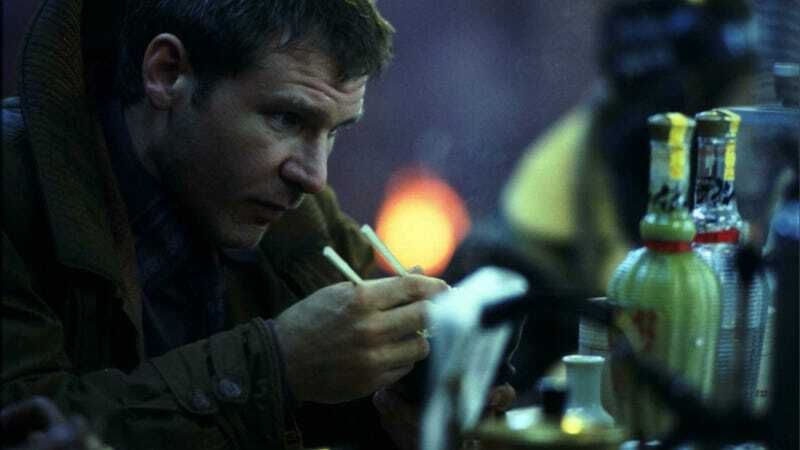 Deckard seems comfortable ordering at a Japanese restaurant, so he must know something, right? Blade Runner has become a cultural mainstay, and if you are vaguely interested in Japan, you’ve probably seen it. This scene in particular has influenced many Westerners who have either visited Japan or dined at Japanese restaurants and who think the “correct” way to use chopsticks in Japan is to break them apart and then rub them together. It isn’t. Look around at any restaurant in Japan, and you’ll very rarely see people rubbing chopsticks together. The only time I’ve ever seen Japanese people rubbing chopsticks was once while camping with my son’s Boy Scout troop: we made chopsticks from pieces of bamboo and used sandpaper—not chopsticks—to smooth them out. When Japanese people use disposable chopsticks (“waribashi” or “割り箸”), they simply break them in half and then start eating. Not only is rubbing them together considered somewhat gauche, it is also completely unnecessary most of the time. Even the cheapest disposable chopsticks have been processed and are made to be split apart. If you break them correctly, you should be fine. That doesn’t mean you cannot get splinters from them and sometimes you’ll see people rub them together a little, especially if a small child is going to use them. According to good Japanese table manners, your chopsticks should not touch the inside of your mouth, such as your tongue or lips. This is obviously difficult for small children, but should be manageable for well-mannered adults. And as fussy as Japanese table manners can get, there are far worse things you can do with chopsticks, such as breaking them apart with your teeth. Sticking chopsticks upright in a bowl of rice, which echoes a funeral ritual, is even more of a faux pas. So, if you do rub chopsticks together, it’s best to do it somewhat discretely and only to remove splinters, and not as some pre-meal ritual in which you whittle two sticks together into silky smooth utensils. But unless you are in some sort of super formal setting, Japanese people will probably overlook your Rick Deckard style chopstick rubbing. This story originally appeared on July 9, 2012.